Yes you’re engaged, yes you have a beautiful ring, but there are still people walking by you without noticing it. How can this be? Are they blind? Obviously some people need an extra clue as to where to look. Here is the solution, ‘Side signage rings to bring more attention to your engagement ring’. 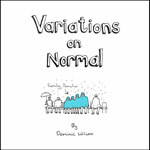 My book ‘Variations on Normal’ will be out on August 21st, full of absurd yet logical invention drawings like the one above. More details here.